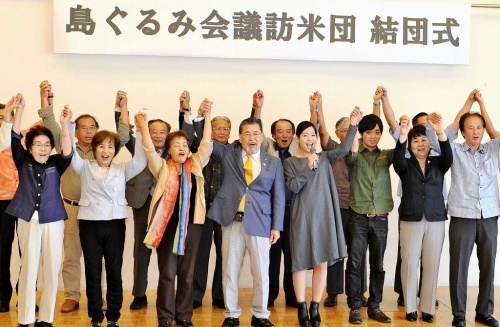 On the afternoon of November 12, at a hall in Naha, the All-Okinawa Council or Shimagurumi-kaigi, a group that “aims to realize the goals of the 2013 ‘Kempakusho’ statement and open up a new future for Okinawa,” held a ceremony to officially announce the formation of a delegation to the United States. The 26-member delegation will visit California and Washington D.C. from November 15 to 21. There, they will explain the current situation in Okinawa, including Governor Takeshi Onaga’s revocation of the Henoko land reclamation permit and the Okinawan people’s strong opposition to the new Henoko base construction. They will work to convince the U.S. side to revisit the Henoko relocation plan. In addition to visiting the offices of U.S. congress members, they will also organize a demonstration in front of the White House together with members of U.S. citizens’ groups and labor unions, and are planning to hold symposia in California and Washington D.C. regarding the Futenma relocation issue. In September, the city council of Berkeley, California passed a resolution opposing the Henoko base construction. The All-Okinawa Council delegates will meet with Berkeley city council members, and will also visit the offices of California’s congressional representatives. The delegates will also meet with San Francisco city council members to discuss the possibility of passing a similar resolution opposing the Henoko base construction in San Francisco. In Washington D.C., the delegates will visit the offices of around 40 Congress members from both the House and the Senate, particularly those involved in U.S. military base issues, environmental issues, and Asia-Pacific policy. Morimasa Goya, chairman of Kanehide Group, will lead the delegation. The delegates come from all areas of society, and include Okinawa prefectural assembly members, various city, town and village council members, business leaders, labor leaders, and students.